Fabrizzios Terrace Youth Hostel i Barcelona, Spania: Bestill nå! I really loved staying at Fabrizzio! The staff is wonderful and the atmosphere is so relaxed! You really feel at home at once! The metro is one block up the street an has a direct line to city center and the beach. It's only a 10min walk to La Rambla and you have a lot of cafes, restaurants and shops near by. 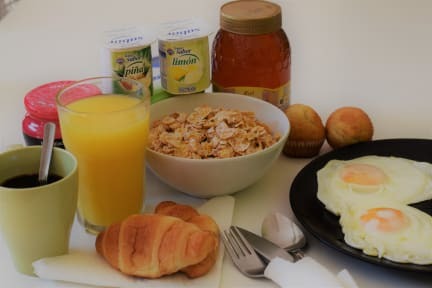 The breakfast is decent and the kitchen have everything you need to make your own food. Recomendeble and good value for your money!